These are exactly what bike polo players need. Capped bar ends. 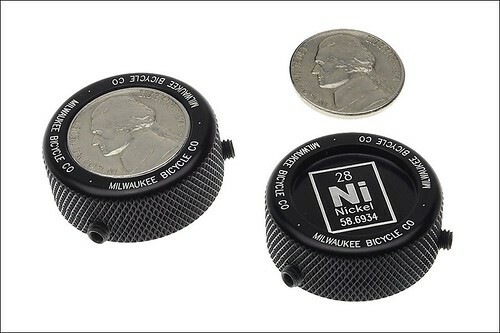 If you like this throw back to the days before readily available machines end caps, spend the $11.99 for a set (nickels are included). You need something to keep from core sampling yourself or friends out on the court, it might as well be something cool. More info: Milwaukee Bicycle Co. This entry was posted by Doug D on November 23, 2009 at 12:01 am, and is filled under Products. Follow any responses to this post through RSS 2.0. You can leave a response or trackback from your own site. Seen in Berlin. Handmade in Sweden. More photos below, click image to view large. Seen on benscycle.blogspot.com Sometimes this is a hard to find item but it’s the best choice. Keep an eye on Ben’s and get’em. click any photo to see large A Trek T1 seen at Ladies Army II and ESPI 5. Steel fork, Milwaukee Bicycle Co. parts, Velocity rims.